In our Hyper-connected world, there is nothing more rare, or more valuable, than a meaningful connection. The nature of business is to find a problem that you can solve which others will pay for. The bigger the problem, the more valuable the solution. The HelpFirst.com story began back in 2007 when I watched as one of the people whom I admire most in this world, Warren Buffett, give the bulk of his fortune ($30 Billion) to Bill and Melinda Gates. Having Studied Mr. Buffets business career, this aligned perfectly with his business ethos of finding the people who are the best at what they do, putting them to work for him, then empowering them to be successful. I remember thinking that Mr. Buffett and Mr. Gates would help more people than they would ever have the opportunity to meet in person. I can think of nothing more honorable, no worthier endeavor, and no higher measure of success. It also reminded me of two other titans of American Enterprise; Andrew Carnegie and John D. Rockefeller. Each of whom capitalized on the changing needs of the market by standardizing the delivery of vital growth resources. They competed with one another through the industries they built, and their understanding of American Enterprise to each generate the largest accumulation of individual wealth in recorded human history. To to turn right around and compete with one another yet again in giving it away. I realized that if Capitalism rewards efficiencies and is built on incentive; IMPACT is most certainly an incentive, and there had to be a more efficient way. I realized that there actually was no market efficiency for distributing Impact. Before Adam Smith wrote Wealth of Nations, he wrote Theory of Moral Sentiment. Many are surprised to learn that in Wealth of Nations the “Father of Capitalism,” discusses charity and human ethics extensively. While much of the philosophy behind Smith’s work is based on self-interest and maximizing profits, “The Theory of Moral Sentiments,” was a dissertation underlying how human communication relies on sympathy. He explored ideas such as morality and human sympathy. Smith argued that people are self-interested, but naturally like to help others. Adam Smith believed, as do I; that market forces can alleviate poverty. Our Impact Marketplace facilitates the evolved market value proposition. We empower the consumer to direct brand impact at the point of sale in a transparent, community focused, relationship building social process while providing a first of its kind service to merchants and brands. Our platform facilitates the consumer control and experience that the modern consumer will come to expect in a process that builds and communicates brand social impact with each revenue generating transaction. Buffett, Gates, Rockefeller, and Carnegie each understood Adam Smith’s theory well; that Capitalism rewards efficiencies and is built on incentive. That, to be a successful Free Market Capitalist, you must think deeper and see further, and provide unique value consistently. We’ve built the HelpFirst Cause Based Social Commerce Platform to facilitate the evolved market value proposition. Concurrently, modern consumers are Impact Driven, looking to make a positive impact through the brands they purchase and the merchants they patronize. Our Impact Marketplace connects consumers with merchants and brands through community impact. Our platform incentivizes community problem solving. If there is nothing more valuable than a meaningful connection, there is nothing more powerful than a meaningful purpose. 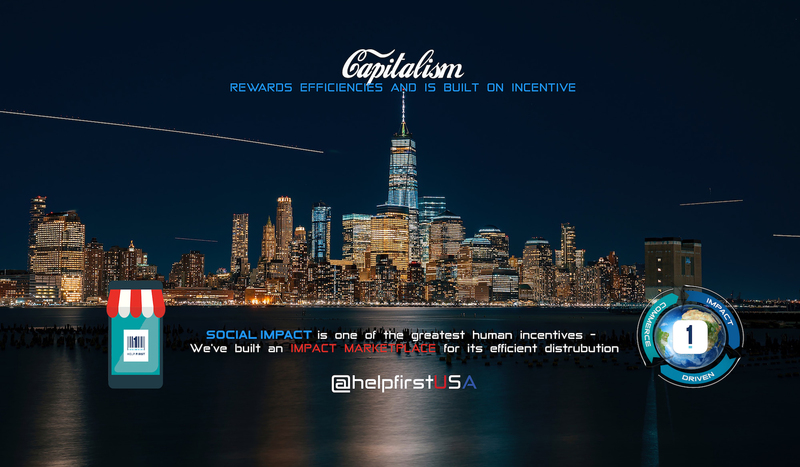 – Each transaction on the HelpFirst Impact Marketplace is a social promotion. We utilize businesses tax deductible charity donation dollars to drive sales that promote their brand and connect with the community. – We’ve found a white label service that for $2800 per month we can provide fee free transactions on our platform for all of our consumer, merchant, and charity partners. We charge merchants $100 per campaign per store location, but require an active campaign for platform listing. We also have a scalable AD revenue model that will deploy in a few months. Success in the digital era will require responsive, engaged leadership and collaborative action through public-private partnerships if we are to effectively manage the unavoidable and avoid the unmanageable. This is why we structured my company as a public benefit corporation: to help facilitate these vital partnerships. We have 89,004 communities that each face unique challenges — challenges that will be exacerbated by the digitization of our workforce. While robotics have plenty of economic and cost-saving benefits, digitization will also have negative consequences. Up to 40% of the U.S. workforce could lose their jobs by 2030. One of the greatest challenges that we’ll face in the coming years will be in how we adjust the wealth creation model once human labor is no longer driving the economy. Many suggest a universal basic income (UBI), and while this is a debate we need to start having, I see UBI with no strings attached as a missed opportunity for community problem-solving. We may be about to lose our warehouse, delivery and service jobs — but we’ll always have community challenges that will require human solutions. We will empower our users to IDENTIFY community challenges, EDUCATE thru Impact focused social content, then EMPOWER through commerce connections of Impact. If we work together and properly utilize the new market technologies and the efficiencies they will create, we can set civilization sized goals and achieve them. HelpFirst isn’t just the name of our company, It’s the evolved Market Value Proposition. HelpFirst.com will be the world’ s first publicly traded public benefit corporation. This entry was posted in B Corp, Community Conscious Capitalism, Impact Driven Commerce, Impact thru Profit, Philosophy. Bookmark the permalink.